Some pets require special food, and all pets benefit from a balanced diet. Our trained and certified staff is available to help you choose the right diet for your pet to keep him or her happy, healthy and active. We have a wide selection of prescription diet to address specific needs. With our on-line pharmacy many of these foods can be delivered to your home without any extra charge. For those dedicated pet owners who make their own pet food, we offer nutrition counseling, vitamin supplements, and referrals to certified veterinary nutritionists for specific diet plans. 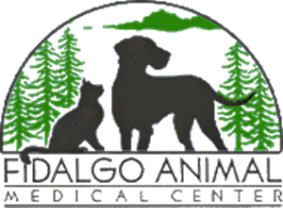 For your convenience, we stock many of the common veterinary medicines and flea preventatives, as well as more specialized medications. We also carry nutritional supplements, and Chinese herbal medications. Many pet owners are unaware that big box and on-line pet medication sellers often obtain their medications from unreputable, and untraceable sources. Because the efficacy of these medications cannot be verified, the medication manufacturers will not honor any product guarantees. Improper storage that can adversely affect medications, incorrect labeling, and ongoing litigation by state pharmacy regulators, are some of the many reasons we do not recommend many on-line medication vendors. We partner with VetSource, a VIPPS (Veterinary-Verified Internet Pharmacy Practice Site) member, accredited through the National Association of Boards of Pharmacy (NABP). VetSource successfully completed the rigorous accreditation process by demonstrating the professional operations of the pharmacy, to ensure quality pharmacy practices are continuously offered to our clients.